100% Pure Responsive: In the past, we came up with RealMag that was a quality responsive template. In this template, we have continued the same thing which we left and this time we have even added a responsive menu (after lots of requests). So, we're sure you all will love it. Movie Niche: We are known for creating niche templates like previously we have covered gags, sports, personal, Islamic and different templates. This template is for movie gurus and pundits who own a movie blog or a community. Related Posts: To make this template stand out, we have also added a plugin that will display relevant movies helping you to reduce your bounce rate and engage more users. SEO Friendly: When we say it is SEO friendly or optimized, it really means it is. This template is highly optimized for search engines which mean your post will get higher rankings in search engine results. We have implemented the same SEO techniques that we're using at Templateism. 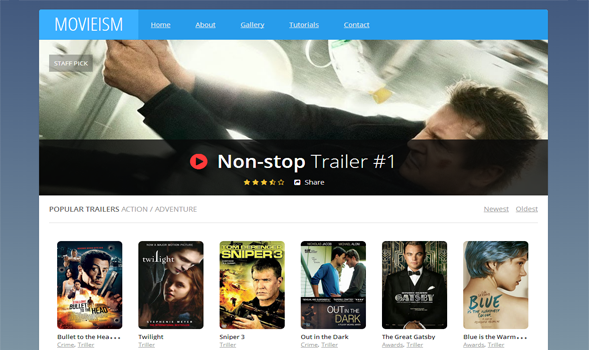 We hope this template would turn out to be useful for all those people who kept on emailing and requesting us about creating a movie, film or cinema niche blogger template. Your request is finally fulfilled now it’s your turn to share it on Facebook, Twitter or Google+. Share your thoughts and suggestions about this theme in the comments below.